In this figure, the gap separates two white candlesticks, which are themselves bullish. 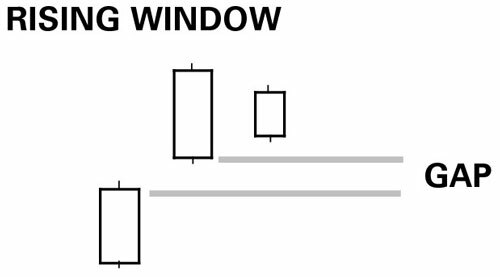 The next bar doesn’t “fill the gap” (called “closing the window.”) The gap between the two price bars is confirmation of the existing trend, and the market’s refusal the following day to go back and fill the gap is further confirmation that the trend is okay. 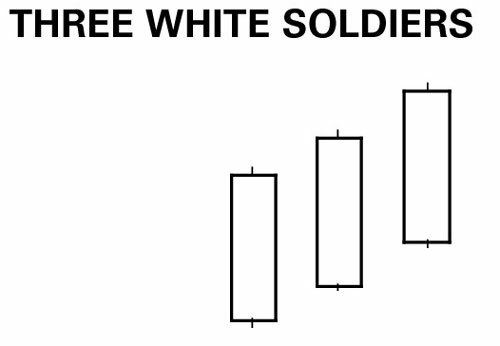 Three white soldiers: In this pattern, what you need to note are the three large white candlesticks in a row. Seeing the close consistently over the open for three days confirms that the price series is in an uptrend, and the size of the bars indicates its robustness. 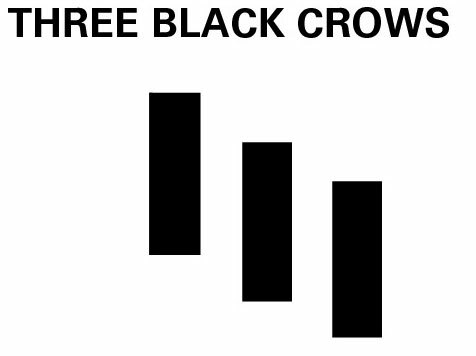 Three black crows: Three black crows is the upside-down mirror image of three white soldiers, only with black real bodies. In this pattern, you have three periods of the close under the open and lower each time, with the bars fairly sizeable. The price series is now in a downtrend.